RECRUITMENT OF JUNIOR ASSOCIATES (CUSTOMER SUPPORT & SALES) IN STATE BANK OF INDIA (Advertisement No. 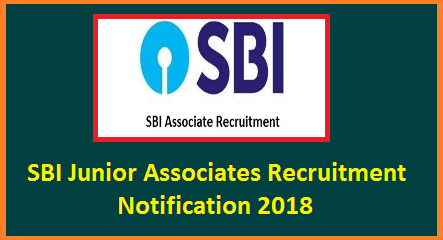 CRPD/CR/2017-18/10) ONLINE REGISTRATION OF APPLICATION AND PAYMENT OF FEES: 20.01.2018 To 10.02.2018 sbi-junior-associates-8301-posts-recruitment-notification-exam-pattern-online-application-fom Applications are invited from eligible Indian Citizens for appointment as Junior Associate (Customer Support & Sales) in clerical cadre in State Bank of India. Candidates can apply for vacancies in one State only. Candidates can appear for the test only once under this recruitment project. The candidates applying for vacancies of a particular State, should be proficient (reading, writing, speaking and understanding) in the specified opted local language of that State (mentioned in the under given vacancy table against each state/UT).The test for knowledge of specified opted local language will be conducted as a part of selection process. It will be conducted after qualifying the online main examination but before joining the Bank. Candidates who fail to qualify this test will not be offered appointment. Candidates who produce 10th or 12th standard marksheet/ certificate evidencing having studied the specified opted local language will not be required to undergo the language test. Note (a) The date of passing eligibility examination will be the date appearing on the mark sheet/certificate or provisional certificate issued by the University/Institute. In case the result of a particular examination is posted on the website of the University/ Institute, a certificate issued by the appropriate authority of the University/Institute indicating the date on which the result was posted on the website will be taken as the date of passing. (b) Matriculate Ex-servicemen, who have obtained the Indian Army Special Certificate of Education or corresponding certificate in the Navy or Air Force, after having completed not less than 15 years of service in Armed Forces of the Union are also eligible for the post. Such certificates should be dated on or before 01.01.2018. Helpdesk: In case of any problem in filling up the form, payment of fee/ intimation charges or receipt of Admission/call letter, queries may be made at telephone no. 022-22820427 (between 11:00 AM to 06:00 PM on working days) or lodge his/her query on http://cgrs.ibps.in.. Candidates are advised not to forget to mention ‘Recruitment of Junior Associate-2018’ in the subject of the email.